Avocado and Brazil nut raw vegan healthy mayonnaise AKA Avozil Mayo. The Brazil nuts give an earthy nutty flavour and up the protein content of this dip. It’s high in fat, but this is all good raw unprocessed plant fats and no oil added. I soak my Brazil nuts overnight, or for at least an hour, so that they are soft and blend smoother. The measurements for healthy mayo are all quite rough as it depends on the size of your produce. Add just enough apple cider vinegar to let the blender do its job. It’s best to use unpasteurised and unfiltered apple cider vinegar as this is the most nutritious with various health benefits. If you can’t get this white wine vinegar also works well. Soak Brazil nuts in water for an hour or overnight. Skin the avocados and garlic. Place all in the blender with enough cider vinegar for the blender to do its job. If it isn’t blending add more apple cider vinegar / water depending on how vinegary you like it. Enjoy your vegan healthy mayo within a couple of days and store in the fridge. You can think of this as a variation on guacamole that can be used to replace mayonnaise in recipes. I often have avozil mayo with steamed sweet potatoes to make a divine sweet potato salad. Also is a great dip to have in the fridge to have with fresh veg or on crackers. This healthy vegan mayonnaise dip will last for a few days in the fridge. You can garnish with anything you like, I tend to use a combination of smoked paprika, chives, red onion and tomatoes. 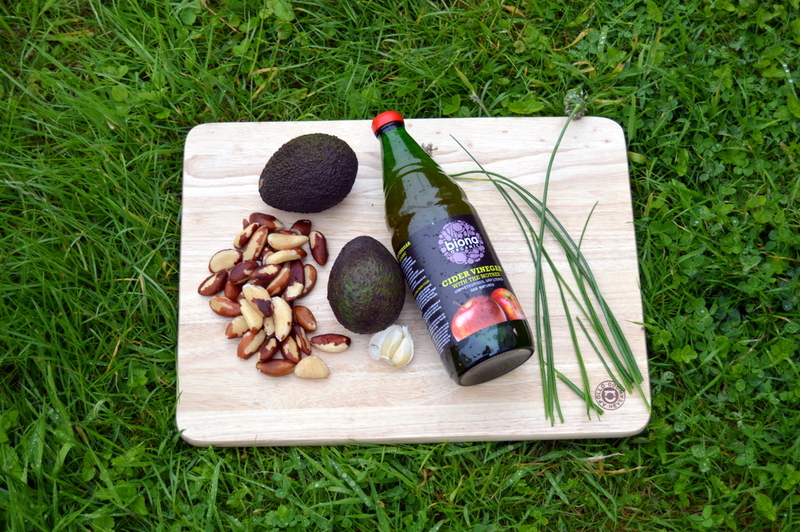 Don’t worry about over blending the avocado as the Brazil nuts will not blend to be totally smooth and will still have texture. If you like this recipe check out my Sweet Potato Salad that features this mayo. A great side dish that is loaded with goodness and filling. Selenium is an essential trace mineral and has many health benefits including maintaining the immunity system. However, like everything, it’s important not to have too much of it. Brazil nuts are very high in selenium so experts recommend consuming about 5-6 a day. It’s ok to consume more than that occasionally but not for several days in a row. Excessive brazil nut consumption has been linked to selenium toxicity so it’s important to bear this in mind. In reality, most people don’t need to worry about eating too many unless you’re eating a few bags a week. This shouldn’t put anyone off enjoying healthy Brazil nuts – even water is toxic in excessive levels. Brazil nuts also contain zinc, magnesium, calcium and vitamin E.
Could you substitute the Brazil nuts for others? ie cashews? I would use sunflower seeds in place of the nuts, not quite as smooth but still great!